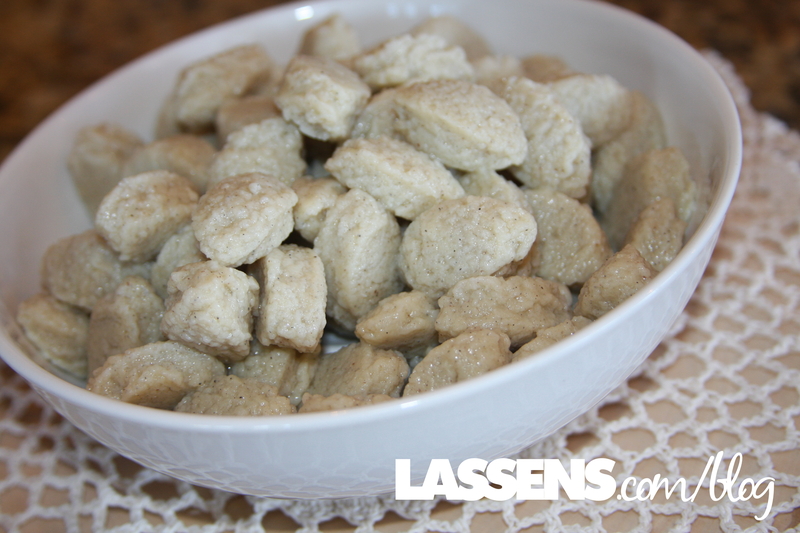 Try These Real Danish Dumplings! These are Definitely Not My Mother’s Danish Dumplings! My mom knew her way around the kitchen, and was willing to try lots of recipes. And our family loved her delicious soups. Occasionally she would make Danish Dumplings, which I liked, but I preferred noodles. 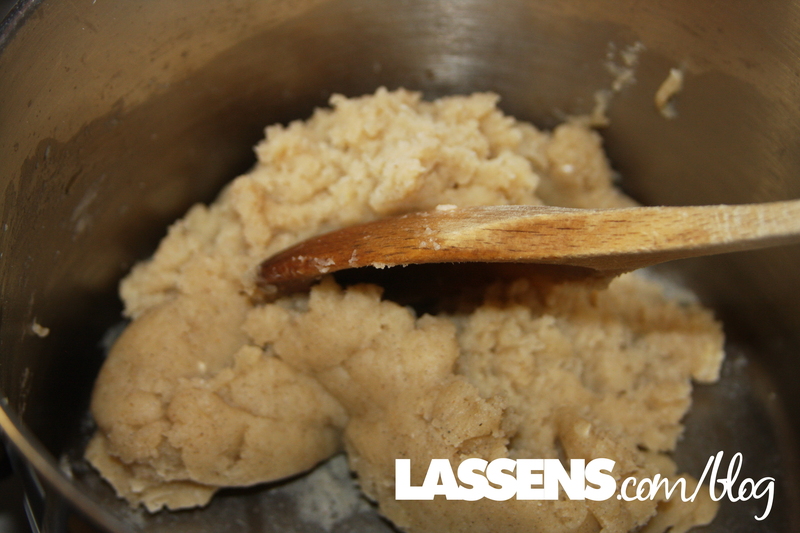 When I joined the Danish Lassen family, I was introduced to real Danish dumplings! I am sure the recipe my mom used had been Americanized to the point of not having much Danish left in them. This recipe comes straight from the motherland, complete with a dumpling press — a bollesprøjte — to make uniform little dumplings. This dumpling (bolle) press belonged to Oda Lassen, our founder. 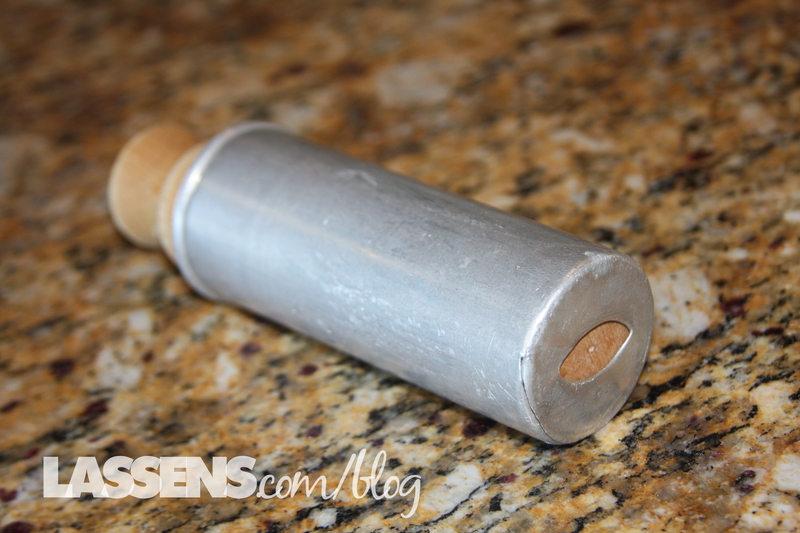 I use it every time I make Danish Dumplings! The Lassen family makes a delicious soup — they call it Captain’s Soup — every New Year’s Eve. The broth is a two-day process, with bones, vegetables, and seasonings. Meatballs and dumplings are made separately, and each year various people make different parts of the soup. For the last several years, my job has been the dumplings. I think this year I finally got the process down to a science, and they were the best ever. 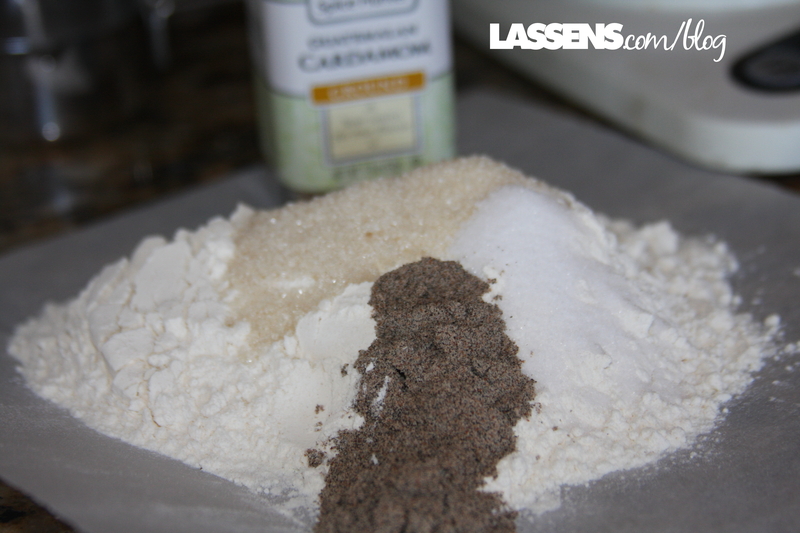 Oda’s recipe calls for cardamom, which is very Scandinavian. 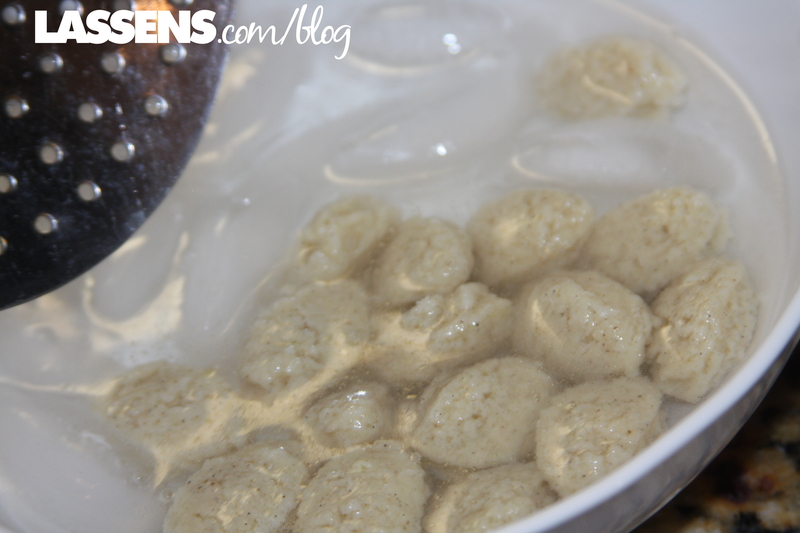 You’ll love the distinct taste that cardamom brings to these dumplings! Add the eggs, one at a time, and mix thoroughly. 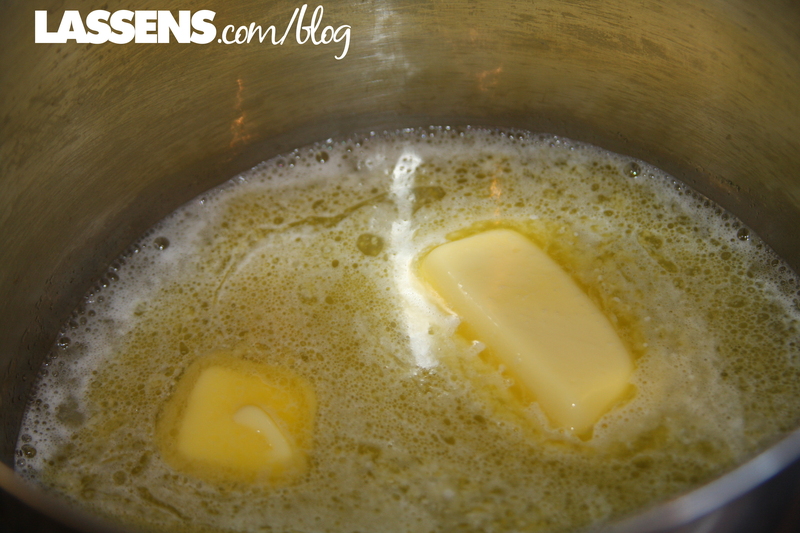 The dough will break up when the eggs are added, but just keep stirring with gusto! The dough will be soft, but should hold together. 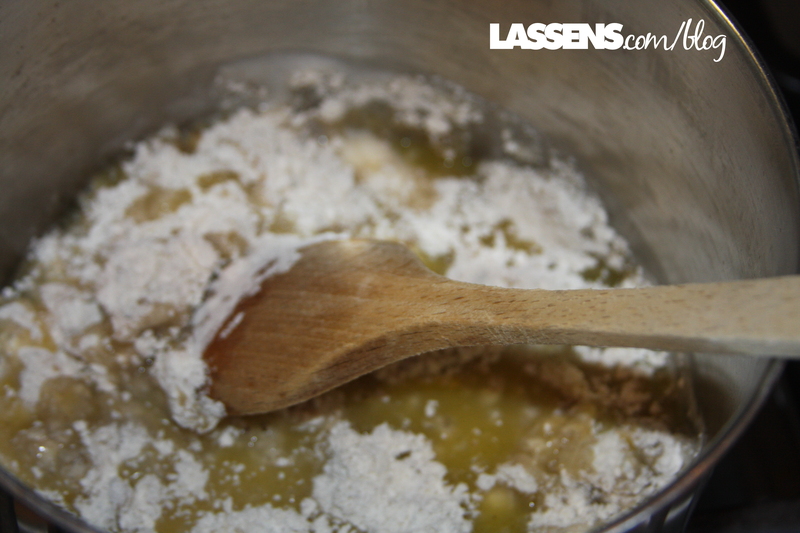 The Danish Dumplings of my youth were cooked right in the soup, but that’s not the real Danish way. 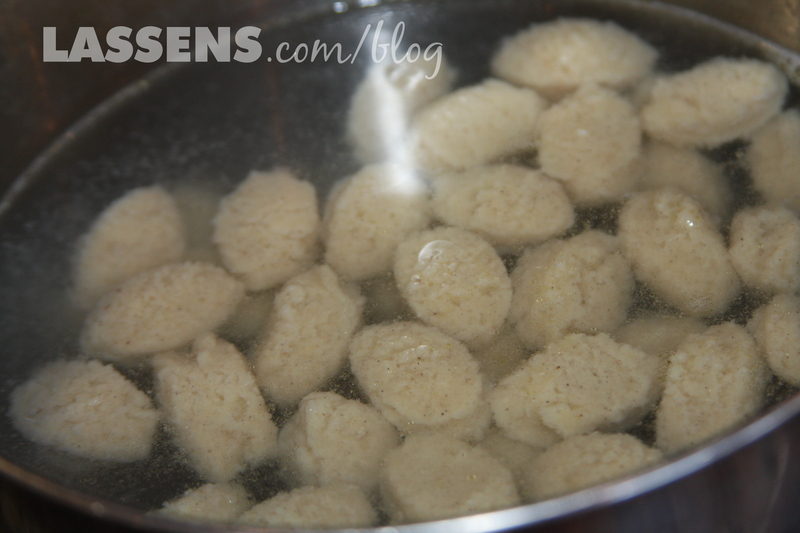 The Danes cook the dumplings separately in salted water. This prevents the soup from having bits of dumpling broken up in the broth. It just looks so beautiful this way! So follow this procedure. It seems complicated, but the finished dumplings are tender yet hold together — delicious! Bring the water almost to a boil and then at the point where the water is about to boil add 3-4 ice cubes to cool the water. You will do this three times. To serve, put the dumplings in a bowl, and then add hot soup. 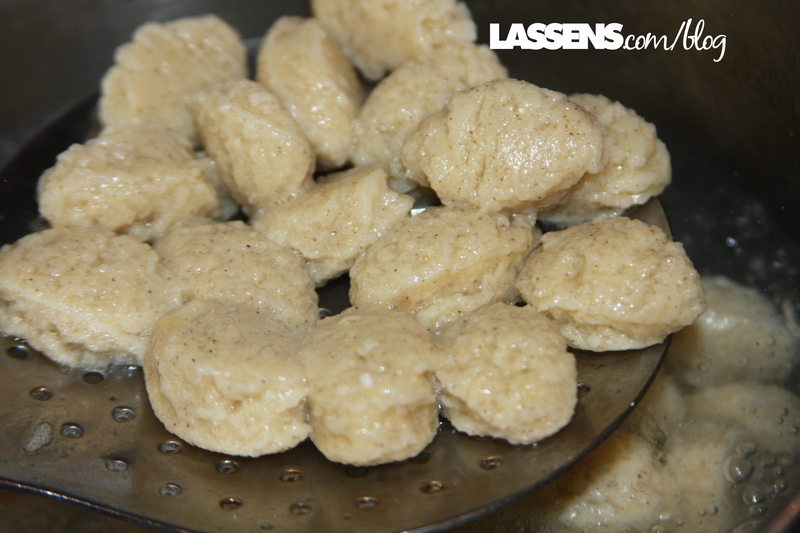 While the Lassen family traditionally has these dumplings on New Year’s Eve, there’s no reason they can’t be enjoyed any time of the year! Now, if only we’d have some soup weather, I could make them again! Could you serve these dumplings with “Swedish” meatballs? Would you still add the cardamom? Yes, these dumplings would be delicious with Swedish meatballs! I would still add the cardamom because I love the taste, but that is a personal decision. Good luck!